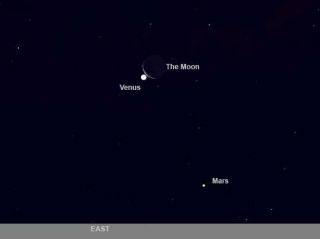 The setup just before dawn on April 22 from the Southwestern United States, and just before the Moon blots out Venus. The scene will appear different from other locations. Sometime before or after sunrise Wednesday, April 22 – depending upon your location – the thin waning crescent moon will cover up Venus for most of North America. Since these are the two brightest objects in the sky aside from the sun, the view will be spectacular even to the unaided eye in many places. This occultation, as such events are called, can best be watched from along much of the U.S. West Coast, where the entire event happens before sunrise. Elsewhere in North American the event will be visible with varying degrees of splendor. In the East, for example, it will be a close conjunction, not an occultation, and it will occur during daylight. The disappearance of Venus will occur before sunrise to the west of the Continental (Great) Divide. If you draw a line from Jasper in Alberta, Canada to Sanderson, Texas, anywhere to the west (left) of this line will see Venus hidden prior to sunrise. For the reappearance, Venus will emerge before sunrise anywhere to the west of a line running from Lincoln City, Oregon to just west of Tucson, Arizona. Both the moon and Venus will be visible low in the eastern sky just before the occultation, with Venus hovering just off to the lower left of the moon making for a very striking scene. At locations where it occurs in a relatively dark sky, you may be able to watch Venus disappear using no optical aid at all. Binoculars will better the view, however. They are especially recommended for Venus' disappearance on the moon's bright limb, and at locations where the sky is bright. For those watching in deep twilight, earthshine on the moon's unlit portion will add to the beauty of the event. Occultations of Venus in a dark or twilit sky do not happen very often for any specific spot on Earth. From Los Angeles, it happened only once in the 20th century (Jan. 13, 1923) and after this year, the next opportunity will not come again until Oct. 11, 2029. Unlike the pinpoint image of a star, which would appear to click off almost instantaneously if occulted, Venus will not disappear suddenly but will take nearly a minute to completely fade out, since it has an appreciable angular size roughly 1/40 that of the moon. About an hour later it will reappear from behind the dark limb of the moon's opposite side, again taking about a minute to swell back to full brilliance. A more dramatic drama awaits those behind the eyepiece of a telescope. The cratered, 8-percent sunlit crescent moon will drift eastward toward the brilliant 17-percent sunlit crescent of Venus. The moon's rough edge will bite into Venus' slender sliver and rapidly devour it. When the planet emerges, it will first come into view as a starlike point that is quickly revealed as a narrow crescent. Even where the events happen in daylight they will be visible with binoculars or a telescope, though the observation will be more difficult. Give yourself plenty of time to find the moon, however, because its low surface brightness against the sky may make it hard to see against the blue sky. Probably the best thing to do is to locate the moon and Venus before sunrise and track them into the day. For the rest of the day, Venus and the moon can be seen together in binoculars. A listing of times for the disappearance and reappearance of Venus is available from IOTA, the International Occultation Timers Association. All times are given in Universal Time (UT). As an example, for Los Angeles (city #286 on the list), the UT of disappearance is given as 12:07:09. Since Pacific Daylight Time currently runs 7 hours behind Universal Time, this corresponds to 5:07:09 a.m. The moon will quite low; just 6-degrees above the eastern horizon (your clenched fist held at arm's length measures 10-degrees). Venus will reappear at 12:57:33 UT (5:57:33 PDT). By then, the moon will have risen higher into the sky (17-degrees), but morning twilight will be well advanced, with the sun just 4-degrees below the horizon. For those living along the Atlantic Seaboard, generally to the east of the Appalachians, the moon will narrowly miss Venus, the brilliant planet just skirting beneath the moon's lower cusp. Across the Southeast, the closest approach will come at around 8:50 a.m. EDT; for the Middle Atlantic States, around 9:05 a.m. and for the Northeast and New England States, around 9:20 a.m.
As seen from New York, for example, Venus will miss the lower edge of the crescent moon by a scant 0.053-degree or just over one-tenth of the moon's apparent diameter. At that moment, the sun will be 35-degrees up in the east-southeast sky; Venus and the moon will be a similar distance above and to the right of the sun. If you can find them against the blue daytime sky, I think you'll be surprised how easy it is to see Venus with the unaided eye; it should appear as a distinct white "dot" just below the somewhat dimmer lunar sliver.